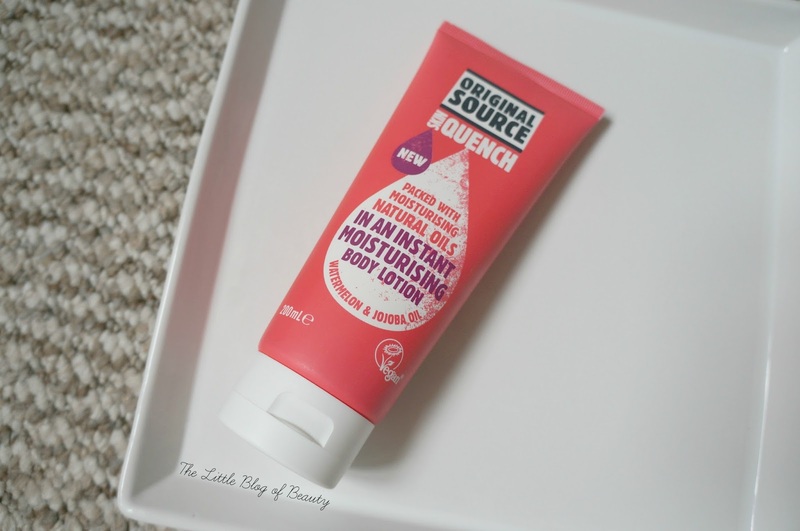 During a recent wander around Boots looking to see if they had the new Original Source dry oil thingy I stumbled across the new Original Source Skin quench body lotion. As this was cheaper than the dry oil, and as I tend to prefer body lotions over oils, I decided to try this out instead. There are four flavours available, watermelon & jojoba oil, peach & apricot, pineapple & moringa oil and lime & coconut oil. I really couldn't decide between watermelon & jojoba or lime & coconut, but in the end watermelon came home with me and lime & coconut will definitely be my next one. I'm very fussy about my body lotion. It has to keep my dry skin moisturised but it also has to sink in quickly and leave nothing behind. I want to be able to get dressed pretty much as soon as I've finished applying my lotion and there's nothing worse than touching your arm or leg later and discovering it's sticky or tacky. My boyfriend often puts his hand on my arm and responds with 'Ugh you're sticky', often even when I don't particularly think I am. I've been using this for a week or so and so far I think it might just be my perfect body lotion. It keeps my skin moisturised (although I'm not sure how it'll stand up in the winter when my skin gets much drier), it sinks in very quickly and it leaves absolutely nothing behind, so there's not even a hint of a sticky feeling. It has a lovely scent, although this isn't particularly strong and doesn't appear to hang around after application. But I'm not really bothered about a scent that hangs around for long. I'm really enjoying using this and can't wait to get through it so I can try the coconut one! The Original Source Skin quench body lotions are £4.49 each and are available at Boots. Have you given any of Original Source's new products a try? I didn't know Original Source did body lotion! Sounds like they'll be good! :) I love coconut! !